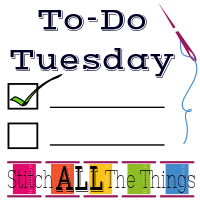 Welcome to To-Do Tuesday hosted by Christine over at Stitch All the Things! Since I don’t have any project pictures to show off, I am going to post a picture from a hike Harley and I took into the Wilderness on Saturday. If you look really closely, you can see her standing on a rock outcropping on the left side of the lake. The hike was gorgeous the entire way and included quite a bit of elevation change. This out-of-shape mama is a little sore from keeping up with her three sport athlete daughter, but it was a fabulous day! The trail starts out in the National Forest of the Elkhorn Mountain Range in Eastern Oregon, and ends in the Wilderness. We have decided to make Sundays our hiking days, and we’re going to continue throughout our summer! 1-3. All three of the patterns I am testing are still in the revision process and haven’t been released, so I can’t show pictures; however, they are all three super cute, and I cannot wait to show them off! 4. TSNEM: Create and Use a Bodice Sloper – Now that we are in a new month, I have a new “Try Something New Every Month” project to work on. I know this one will be much more difficult than the past few months simply because I will have to coordinate with someone else to help me measure if I end up making a sloper for myself. I haven’t fully decided if I will be making one for myself or one of my daughters. 5. Sassy Librarian Blouse – I am going to make this blouse right away because I really want to be able to wear it this summer. I cannot wait to show pictures (hopefully next week) of the patterns I’m testing and to get started on the Librarian blouse – I have some gorgeous fabric set aside to make it with. 1. Dress Pattern Testing – finish sewing a couple more and take final pictures. 2. Swing Top and Dress Pattern Testing – finish sewing a couple more and take final pictures. 3. Blouse Pattern Testing – finish sewing a couple more and take final pictures. That hike must have been spectacular if the view is that gorgeous in the photo. WOW!!! What a great way to spend the summer with your girls. How fun! Thank you – the hike was absolutely gorgeous! We are very lucky here – if you stand at the right spot on one of the mountains that encircle our valley, you can se four different mountain ranges: Blue, Wallowa, Elkhorn, and the Eagle Caps! The best part is that they are all within an hours drive! I’m looking forward to seeing what you stitched up for those pattern testings. Your hike photo looks gorgeous, and a nice way to spend an afternoon with your daughter. The patterns are really great! They are supposed to release Monday, so I’m hoping I can post pictures next week. The hike really was gorgeous, and it was some great bonding time with Harley.